I’ve already raved about Ariely’s book Predictably Irrational countless times (it’s on my list of top 5 books every marketer should read) and thoroughly enjoyed his work in The (Honest) Truth About Dishonesty (and his other books) – so when I saw he had a new book available, I immediately ordered a copy. Unlike his other books, however, Payoff is a bit more of a primer and overview of some of the concepts he talks and writes about regularly – rather than a full-blown new piece of work. In fact, it’s a release by TED books meant as a companion piece to a recent talk Ariely gave at TED, allowing the subject matter from his talk to be more deeply discussed than TED’s 18 minutes allow. 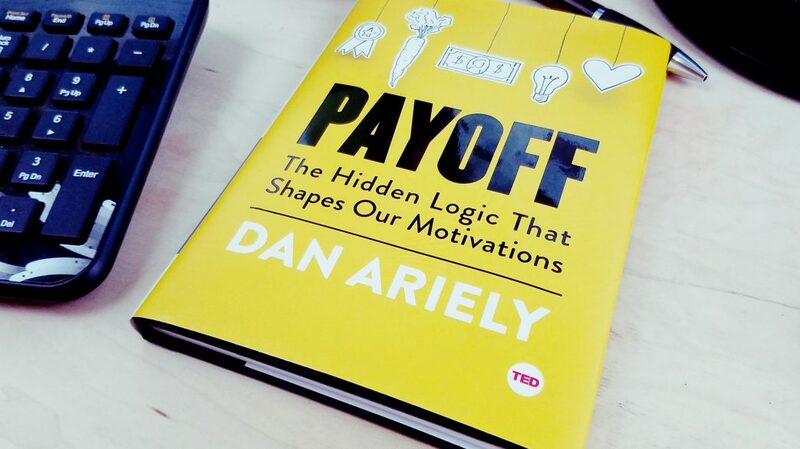 For Payoff, Ariely focused primarily on his research on the subject of how we are motivated. This includes motivation in life, as well as in business, and gives the reader some great examples of how different logic (primarily emotionally-influenced) can affect the ways in which we are motivated (or demotivated) to do things in our lives. In many ways, it’s a great companion piece to Daniel Pink’s management book, Drive, in that Ariely goes into detail about how the financial aspects of motivation tend to fall flat (or at least see diminishing returns) and how concepts of meaning and purpose tie into our motivations much more than a paycheck does. (Note this doesn’t mean a paycheck isn’t important – something that Drive dives into quite a bit more than Payoff, does. It’s more in the vein that if people are paid a fair wage, simply dangling extra cash in front of them will only result in short-term gains). For those who haven’t read Ariely’s other work, I absolutely recommend giving Payoff a look. Especially if you are looking for a quick read that still has a good amount of meat (at 102 pages you can easily read it in a day, or on a flight). It’s particularly useful for those of us who work with others – whether it be managing or simply interacting with co-workers (who, let’s be honest, is pretty much everyone). By reading Payoff you’ll be much better equipped to empathize with those you work with, and who you rely on. When you start to truly understand what’s motivating peoples’ actions, you can do a much better job of presenting yourself and communicating with others … ideally to get done what it is you want to have happen. And again, isn’t that what marketing is about? Understanding a customer’s needs and motivations so that we can best present them with a solution worth paying for? You can buy Payoff on Amazon here.